Phoenix Contact selects the secure licensing capabilities of Wibu-Systems’ CodeMeter for the distribution of PC Worx Engineer. 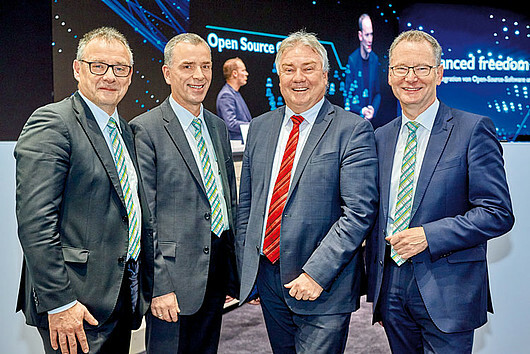 In the picture, from left to right, Hans-Juergen Koch, Executive VP, Business Area Industry, Management and Automation, Phoenix Contact Electronics GmbH, Friedrich Wegener, Specialist Software Standardization, Phoenix Contact, Oliver Winzenried, CEO and Founder, WIBU-SYSTEMS AG, Roland Bent, General Manager, Phoenix Contact. © Phoenix Contact. Phoenix Contact, a global market leader and innovator in the field of electrical engineering, electronics and automation, and Wibu-Systems, a global leader in secure license lifecycle management for business and industrial environments, announce the integration of their flagship technologies at the Hannover Messe 2018. CodeMeter, the comprehensive solution for protection, licensing, and security, has been selected by Phoenix Contact as the best-in-class technology to streamline license and entitlement management of their PLCnext control system solution. PC Worx Engineer, known as the comprehensive programming software engineering solution suitable for lots of Phoenix Contact controllers, can be used to implement complex automation concepts and is therefore offered in different payable or free of charge versions, available with additional add-ins. In a global scenario influenced by the emergence of Industrie 4.0 and with captains of industry shifting their attention from hardware to software in the value chain, a centralized license lifecycle management solution became of the essence. In this first stage of the project, Phoenix Contact has focused primarily on the ability to offer their software in a modular, scalable, and efficient fashion. Additionally, their requirements included the need to protect their digital know-how and support the different ERP implementations that were installed at their various locations around the globe. CodeMeter was able to completely fulfill their expectations. With AxProtector .NET, they automatically encrypt classes and methods of their software and shield it with a safety shell against piracy and reverse engineering. With CmActLicense, an encrypted and signed file, they bind the license of their software to a fingerprint of the target system. Alternatively, they can associate licenses with CmDongle hardware secure elements that come in several form factors, including USB sticks, memory cards, and ASICs. With CodeMeter License Central, they create, deliver, and manage standalone, network, demo, and emergency licenses of their software and its add-ons. The ERP integration challenge was overcome with the use of CodeMeter License Central Connector, which made it possible for Phoenix Contact to interface their enterprise resource planning systems ranging from different versions of SAP to Baan with Wibu-Systems’ online database derived solution. Orders for PC Worx Engineer are sent from the worldwide subsidiary offices of Phoenix Contact to the SAP system located at their headquarters, and processed almost instantaneously. Oliver Winzenried, CEO and founder of Wibu-Systems, is excited by the opportunities that have come forth from this first step in cooperation: “Data driven applications, cloud centric platforms, and security technologies are fueling the current IT spending of companies; these are not mere costs though, but rather an investment in a digital, global, and secure marketplace. Our fruitful collaboration with Phoenix Contact reflects the digital transformation of the engineering field and a new business approach built on immediate and diversified responses to the market needs”.